A rich, deep bronze or polished rose gold metal frame with a brushed rose gold plate is a professional-looking addition to any office door or desk. 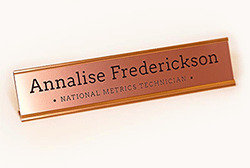 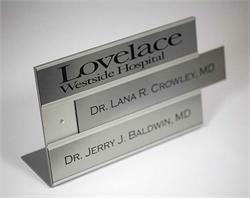 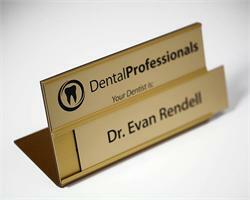 The rose gold plate (1/16" thick) with brushed metal-like finish can be customized with any laser-engraved text you need including employee names, job titles, copay information, messages for reception desks, hotel front desks and more! 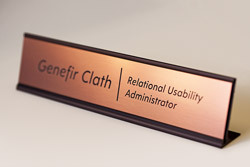 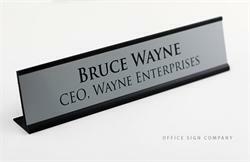 Available as a 10"W x 2"H wall or desk frame in a matte arch bronze or polished rose gold aluminum. 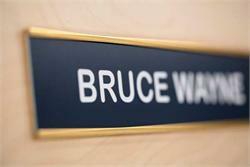 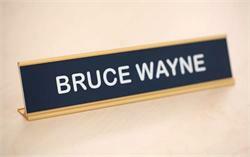 Plates can be left unglued for interchangeability so you can order a replacement plate when names or job titles change in the future. 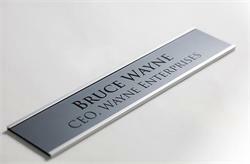 If you require a size or frame color not listed, please contact our customer service team via e-mail at service@officesigncompany.com or via phone at (701) 526-3835.